Glass and Aluminum doors are typically used in most retail and commercial businesses and are the first experience your customer has with your business. With many repair and replacement options available making a statement for your business just got that much easier. Closers have a limited life and fail sooner in high use areas and can be identified by a slamming door or by a clear leaking fluid above and around the door and closer. These closing devicescan be quickly and easily replaced to insure your doors are working safely and properly. Most common door pivot and hinge types are stocked on our service trucks for immediate same day repairs. We can update your existing glass to new insulated technologies or we can board up a broken piece and replace it with new. Same day service is available for quick and easy repairs. 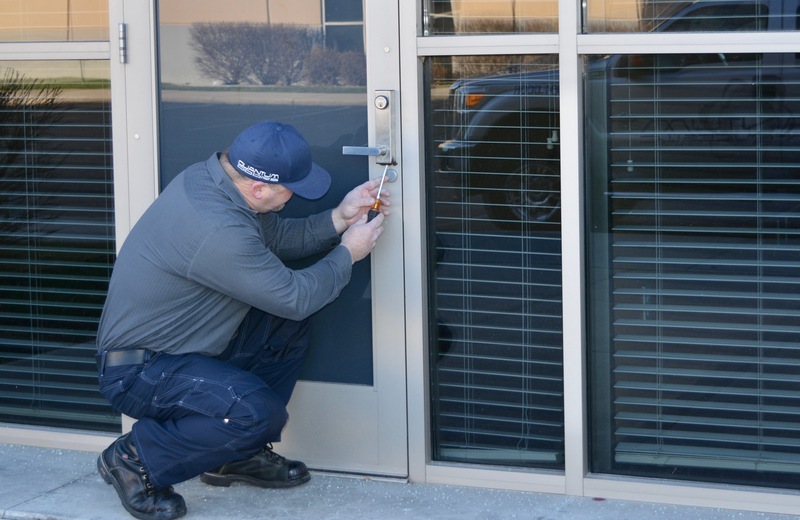 Most common storefront locks are stocked on our Service Trucks for immediate same day repairs. No need to replace your existing door! Panic exit devices can be easily installed on your existing steel or glass doors. Access Controls can be used in conjunction with panics to meet most of your security and code compliance requirements. There are solutions for all door areas with our vast knowledge of seal types and resources we can insure your business succeeds in keeping these pests out! With energy costs soaring it is good to know there are inexpensive, long-term solutions to seal those doors and frames. If that noisy street is problematic for your business there are many products and solutions to help with your existing doors too. With contemporary building architecture becoming more main stream and older buildings being constantly updated and improved there are so many full glass doors, frame and hardware styles to choose from. We also stock the most common parts for these doors for same day repair service if the doors are in need of repairs. Professional Board up service to insure security when the glass has been compromised. Glass replacement as well as new technologies to help save energy and money! Lubricating all pivot points, locks and points of friction insure the door operates at its best, and most efficient to extend door hardware life and reduce or eliminate repair costs.